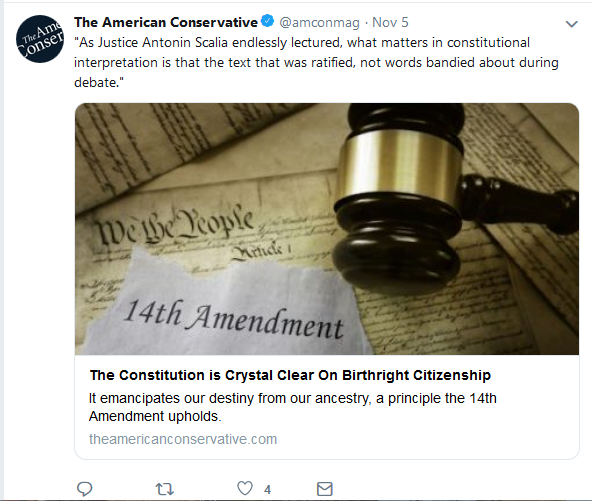 When I first read this tweet from The American Conservative, authored by Bruce Fein, I was startled that anyone would defend Scalia’s conception of ‘Textualism’, no matter the context. Questions of interpretation arise when the meaning of a statutory text is not clear. Scalia believes that the theory of textualism requires courts to determine statutory meaning by referring to ordinary language usage, to generally accepted rules of construing texts, and to other legislation that has been passed. The chief theoretical position that Scalia wants to defend in A Matter of Interpretation is that courts ought scrupulously to avoid referring to legislative history when they are attempting to understand an ambiguous statute. Legislative history consists of items such as committee reports, floor debates, and legislative drafts—all the available documents and statements that accumulated while a statute was being passed. Scalia writes: “I object to the use of legislative history on principle, since I reject intent of the legislature as the proper criterion of the law.” Scalia fears that if judges can rely on legislative history, courts will engage in “judicial lawmaking” by seizing on one piece of evidence or another to write their own preferences into law. Scalia’s relentless campaign against the use of legislative history, and his refusal to join opinions interpreting statutes by referring to that history, have been astonishingly effective. One recent study estimates that the proportion of Supreme Court opinions in cases involving statutory construction that refer to legislative history has dropped from 100 percent in the 1981 term to 18 percent in the 1992 term.2 Scalia may justly claim a large share of the responsibility for this transformation. For this reason it is all the more important to stress that Scalia’s opposition to the use of legislative history rests on exceedingly shaky theoretical foundations. Scalia readily acknowledges that if the meaning of a text is unclear, “the principal determinant of meaning is context.” In ordinary life the intentions of a speaker are central to the process by which we determine his meaning. If someone casually observes that “Casey has thrown a disc,” I would want to know something about the speaker’s intention in order to understand whether the comment refers to the state of Casey’s back or to the integrity of his CD collection. Scalia does not dispute this, and he even concedes that there may be extreme cases where legislative history may be consulted in order to determine whether there has been a “‘scrivener’s error,’ where on the very face of the statute it is clear to the reader that a mistake of expression…has been made.” In his commentary, Ronald Dworkin cannily seizes upon this concession and brings out its implications. In my search for the Story essay, I came across the August 23, 2012 essay by Richard A. Posner titled ‘The Incoherence of Antonin Scalia Scalia’ at The New Republic. Which is a review of a book by Justice Antonin Scalia and the legal lexicographer Bryan Garner titled Reading Law: The Interpretation of Legal Texts, 2012. Posner wastes no time kowtowing to Scalia, perhaps because he has an ego to match that of Scalia. This polemic is first of all well written, and scrupulously argued and focused on exposing the ‘Textualism’, that Scalia makes the center of his Legal Theorizing, is on close analysis, without merit backed by incompetent or just disingenuous arguments. ‘Textualism’ appears to be just so much ideological window dressing for Scalia’s ‘Originalism‘ , yet even ‘legislative intent’ also plays a part in the thought of the later Scalia. These two essay deserve to be read in their entirety, such in their importance. In dismantling the myth that Scalia was a formidable legal theorist. When he is, in fact, an American Political Romantic, in the guise of a pugnacious bully whose arguments are steeped in a self-serving intellectual dishonesty.